By Gianluca Di Caro: On Saturday night, whilst most British boxing fans were either at the Manchester Arena or watching BT Sport as Tyson Fury made his long awaited return to the ring, a large number of local boxing fans still made the pilgrimage to the Jubilee Sports Bank in Liverpool for local promoter Kyle Gallagher’s latest offering. Over the past few years Gallagher has built himself a very good reputation for putting on quality shows, one where the local fans know they are in for a great night out and watching well matched all action fights featuring local prospects and on Saturday normal service resumed. Headlining the show was local unbeaten prospect Martin Freeman, against seriously tough opposition in Latvia’s Dmitrijs Ovsjannikovs. On his last appearance, on a Gallagher promoted show back in March, Ovsjannikovs secured victory over Freeman’s gym mate Mitchell Walsh, via a second round TKO, which added an extra bit of spice to this particular bout. The opening round see Freeman on the front foot, Ovsjannikovs seemingly content to counter for the majority of the round, with the occasional attacking foray whenever the opportunity arose. Initially it was more of the same in round two, however as the round progressed Ovsjannikovs began to get a bit busier, actively taking the fight to the Liverpudlian, but all said and done it was still Freeman’s round. Freeman’s movement in the third was poor, he was limping at times, and Ovsjannikovs clearly noticed this and started to be more assertive in his approach, so much so that often he would corral Freeman in a corner before letting rip with a flurry of shots. Freeman’s corner were screaming at their charge to get out of the corner, can’t blame them as it was this tactic by Ovsjannikovs that led to their man Walsh being stopped by the Latvian back in March. Freeman made it through the round, but now was just the one round up as the third was clearly Ovsjannikovs’. Freeman’s corner worked frantically on his leg during the break, but when the opening bell for the round rang it was clear to all that the injury was really troubling the Liverpudlian. The fourth mirrored the third, Ovsjannikovs controlling the proceedings, but Freeman dug in deep and survived the round. Again in the break Freeman’s team worked hard on their charge. With the scores equal going into the fifth Ovsjannikovs went on the offensive once more, however Freeman, whilst still limping, didn’t just settle for countering, oh no, he decided if it was do or die and started to plant his feet once more and let rip with big shots, so much so that Ovsjannikovs reverted to a defensive approach and countering at times, much to the relief of Freeman’s corner I would think. The sixth and final round was a stormer, again Ovsjannikovs went hard on the attack in an attempt to back Freeman into a corner, however the Liverpudlian wasn’t having any of it and some excellent toe to toe slugging ensued, it was a thrilling final round, control switching back and forth throughout until the final bell. After six hard fought rounds Referee Chris Kelly’s scorecard read 58-56 in favour of Martin Freeman. The penultimate bout of the night sees Widnes, Cheshire’s Jamie Oldfield, in action against Belfast’s Marty Kayes, in a four round Welterweight contest. Oldfield came into the fight off a first round stoppage win over Edgars Sazanovics on his pro debut back in March, whilst Kayes, a well known and always busy opponent, came into the fight off the back of two excellent points victories in April, his first wins since July 2016, some sixteen fights previously. Right from the off it was Oldfield that took the fight to Kayes, the Irishman though stood his ground and countered effectively and so began a fantastic all action round. It was a great round, you just couldn’t take your eyes off the fight for a second as these two warriors went to war, both digging deep into their arsenals of shots, each time one of them seemed to be taking control, the other would counter with equal force to wrestle control. Great round just couldn’t split them, definitely a drawn round in my eyes. More of the same in the second and third, although in both Oldfield seemed to just about secure the rounds due to more effective attacks. I must just mention a couple of exchanges, where Oldfield and Kayes went toe to toe exchanging double handed combinations, both guys letting rip with 10-12 punch combinations at the same time, wow, really enjoyed those. Another local debuting fighter, David Tayor, was next up, against Latvia’s Vladimirs Slikovs in a four round Super Middleweight contest. Both protagonists came out hard and fast, both battling hard for centre ground, what’s more it was clear that neither had any intention of backing down for a second. Throughout the first round it was hard to split the two, each time either let rip with a shot the other countered in similar fashion, no surprise that even Referee Chris Kelly couldn’t split them on his scorecard. Round two was once again an all action round, Slikovs maybe being more on the front foot, however even though Taylor was having to defend more often, it was he that landed the most shots, more importantly the most telling shots. More of the same in the third, with Taylor clearly winning the round, however the fourth, whilst similar to the previous rounds, except now Slikovs was able to get his range right and land some big shots. After four all action rounds Referee Chris Kelly’s scorecards showed just how close this bout was, as they read 39-38 to David Taylor. Following the interval local debuting lad Steven Sunners faced Latvian Eduard Belas in a four round Middleweight contest. Right from the off Sunners went on the attack, however Belas is as savvy as they come and used his experience to keep Sunners from landing a serious shot initially. However Sunners kept calm and used his jab to great effect to fashion a good opening early in the round and landing a cracking body-shot. Belas changed tactics and went on the offensive, Sunners didn’t seem that concerned and just kept jabbing to the head, forcing Belas to keep his guard high. After a few more exchanges, Sunners threw a neat combination, creating just enough of an opening to slip in another good solid shot, this time with the required effect of sending the Latvian to the canvas. Belas made the count, immediately after the restart Sunners was all over the Latvian like a rash, letting shots off whenever an opening presented itself. It wasn’t that long until another chink in the Latvian’s armour appeared, Sunners reacted immediately and again sent Belas to the canvas. Belas again made the count and defended well until the end of the round. Round two started in much the same way as the previous round ended, with Sunners in full flow and Belas covering up and defending with an occasional shot of his own. However, after about fifteen seconds or so Sunners landed a big right hand that sent the Latvian heavily to the canvas, Referee Chris Kelly immediately waved the fight off, he didn’t even start the count, instead summoned the medical team to enter the ring and attend to the stricken Belas. I’m pleased to say Belas was OK and when he eventually rose to his feet, received a warm round of applause from all in attendance. Official time of the stoppage was just 22 seconds of the second round. Just prior to the interval the fifth fight of the night pitted local lad Craig Kennerdale against Prestwick, Scotland’s Leon Roberts in a four round Welterweight contest. This much anticipated contest between two highly rated young fighters was expected to be a cracker, but it turned out to be much more than that it was a sensational fight between two equally matched warriors. It reminded me very much of the classic Battle Royale between Carl Frampton and Ian Bailey in Belfast a few years back, after that one the entire crowd at the King’s Hall were on their feet applauding both warriors, and it comes as no surprise that after their fight on Saturday night that Kennerdale and Roberts also received a standing ovation from the crowd in Liverpool, boy oh boy they deserved it one hundred percent. As with Frampton-Bailey, it was non-stop action throughout, Kennerdale and Roberts fought magnificently for every second of each round. These two serious talents really went for it throughout the contest, control switching between them with such regularity you just couldn’t take your eyes of the fight for a second. On many occasions this battle had the highly vocal fans standing and applauding the action, especially a couple of double handed exchanges, where both protagonists not only matched each other punch for punch but also flowing combination for combination. Referee Chris Kelly scored the contest 40-37 in favour of Kennerdale, which to be honest whilst the correct result just doesn’t reflect just how close every single round was. Loved every second of this fight, it really was something special, so if you get the chance try and watch the video, which I have been told will be on YouTube later this week, definitely well worth watching. Have to say this was my first choice of Fight of the Night, just as you would have already read above there was definitely more than one contender for that accolade. The fourth bout of the night pitted Bradley Muldoon against debuting David Calveley in a four rounder. Prior to the fight there was quite a bit of talk about this match-up on social media, apparently they had fought twice previously, word was that it was the debuting Calveley that had won both. Right from the opening bell it was Calveley that went straight on the attack, Muldoon initially covered up but soon began to utilise his jab effectively to prevent the hard charging Calveley to corral him against the ropes. Throughout the round it was Calveley virtually bossed the round from start to finish, effectively keeping Muldoon on the back foot. More of the same in the second and third, but the fourth was a much more closely fought round, one in which Muldoon held his own. After four rounds of action Referee scored the contest 40-37 in favour of Calveley, however that wasn’t the end of the matter, as Muldoon protested that it was supposed to be a six rounder and called for the fight to be declared a no-contest. Apparently the promoters running sheet in the changing room showed it as a six rounder not the four as announced at the beginning of the fight and listed by the commission on the schedule. 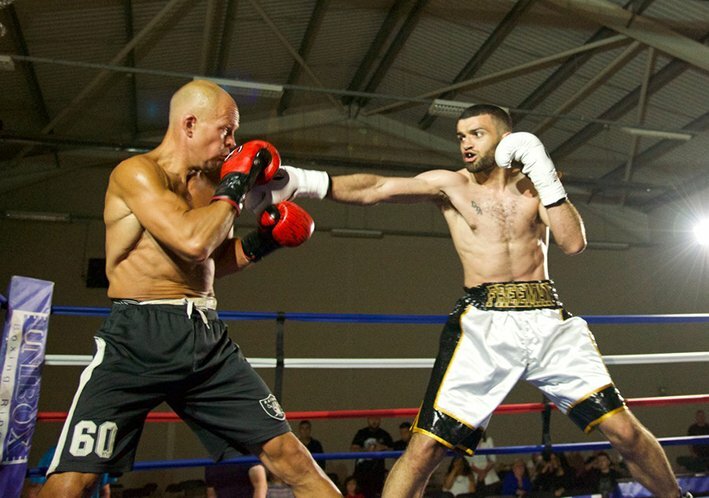 Liverpool’s Dean Ferreira versus Latvia’s Andrejs Konovalovs in a four round Super Featherweight contest was the third fight on the card. Ferreira seemed determined to make a big statement in this fight, coming out hard and fast right from the opening bell and letting rip with big shots, Konovalovs initially covered up, but soon realised he’d have to fight his way out of danger and proceeded to do just that. Ferreira though is as tough as they come and he soon wrestled back control and backed his Latvian foe back onto the ropes before letting rip with fast double handed shots to send Konovalovs down within the first thirty seconds or so. Konovalovs made it to his feet almost immediately, on the restart Ferreira went straight back on the attack. Konovalovs got behind his jab in an effort to keep the hard charging Liverpudlian at bay, but that didn’t last for long once Ferreira started targeting the Latvian’s body and on around the one minute mark Ferreira let rip with a big shot to the Latvian’s lower rib, which sent Konovalovs down like a sack of potatoes. Konovalovs was clearly in distress so referee Chris Kelly stopped the count on three and waved the contest off so the medical team could attend to the Latvian. Official time of the stoppage was 1 Minute and 3 seconds. The second fight of the night pitted debuting Lee Cooper against one fight veteran Kyle McNicholas in an all Merseyside four round Super Middleweight contest. Cooper approached the opening round in determined fashion, taking the fight to McNicholas right from the off. Throughout the fight Cooper was well and truly on the front foot and very, very focused, Cooper controlled the proceedings more like an established prospect than a debuting fighter. Don’t get me wrong this wasn’t a one sided contest, far from it, McNicholas fought hard for every second of every round, just Cooper’s performance was exceptional. After four excellent action filled rounds referee Chris Kelly rightly scored the bout 40-36 in favour of the debuting Lee Cooper. The opening fight of the night featured Warrington’s Ben Hough in action, against Blackpool’s Malcolm Richardson, in a four round Cruiserweight contest. Right from the off Hough got behind his jab, Richardson responded in kind, however Hough just doubled up his jab and began to back Richardson up towards the ropes. What followed next was about a minute or so of engaging action, which see Hough on the front foot with Richardson defending his position, then just as Richardson went to let rip with a shot Hough got through the Blackpool man’s excellent defence with a big right, that sent Richardson down heavily to the canvas. Immediately referee Chris Kelly waved off the fight and the medical team entered the ring. I’m pleased to say Richardson was perfectly OK, but must praise both the referee and medical team for the prompt actions, as the way Richardson went down it did look like a full on knockout. Official time of the stoppage was 1 minute and 16 seconds of the first round. Once again a great event from Kyle Gallagher and his team, word is his next event will be in September and from what I’ve heard on the grapevine this will be a ‘don’t miss’ event as not only will top prospects from his stable be in action, but also featured on this event will be a number of unbeaten prospects from abroad.